Now, here is a question, what do you do with all your seamless backdrops while they are not in use? Store them of course. Savage has a nice sponge system for storing backdrops, the right way – standing up. Why do you want to store them standing up? Because if you store seamless paper lying down you will get rippled paper. The weight of the paper sets on the bottom part of the paper and presses it against the floor. While this does not crease the paper, it reshapes it into an oval, and when rolled out it will show ripples. not that good. So, how about that Savage system again? 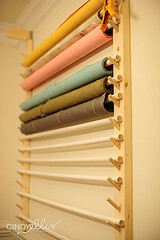 Well, to store a seamless upright, you’ll need a wall as high at least as the length of the paper – 3 meters. While this is not rare in studios it is kinda rare in home studios. Reader Mathew Roch sent a tip via twitter about a way to mount seamless on a rack. This sounds like an elegant solution because you A – don’t need a high ceiling and B – since the paper lays on a rack it is not pressed against the floor. Cindy Ellis shows a rack just like this (only smaller) on her flickr. 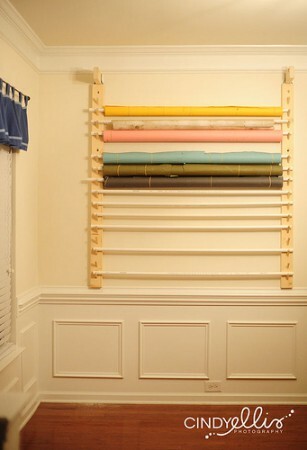 The wall mount is made with some lumber and the backdrops are resting on PVC pipes. Kinda self explanatory once you see the picture. To avoid ripples the backdrops are rolled up tight and fastened with rubber bands. Smart. Here is the mount as build by Cindy’s “fabulous hubby”. The top bar doubles as roll holder when taking photographs. Thanks for the tip, Mathew and Cindy. Got more tips? send them by @diyphotography on twitter. I realize this is an old post, but still a relevant topic. For those of us not gifted as diy hackers — how would we acquire wood pieces with these angled holders built in? Would we have to pre drill holes in standard lumber at an angle and then add these pieces? If so, What are these pieces called?